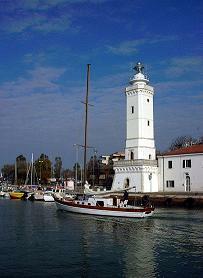 Rimini port canal was created at the original mouth of the Marecchia river. It counts 158 moorings. Only boats with maximum length of 18 mt are allowed. The canal is from 2,40 to 4,50 mt deep. The stretch of the canal between the bridge of the railway and the Roman bridge of Tiberious allows the mooring of many boats no more than 1,25 mt high from the water level. Different activities bound to fishery are on the left-hand-side of the canal: from shipyards to machine shops, from the wholesale fish market to marine shops. On the right-hand-side is the beautiful white lighthouse, that is 27 mt high and its light extends for more than 15 miles. It was built on the foundations of the old lighthouse first erected in 1754 and destroyed during the Second World War.